NATO's top official has announced plans to re-establish contact with Russian military leaders after months of tensions, calling the relations "important". "We have talked an awful lot about how we re-establish communication and the fact that the communication with our senior military interlocutors in Russia is important," NATO's General Philip Breedlove, who also serves as the Commander of the US European Command, said on Thursday as quoted by Reuters. Correspondence between the military heads have been tense over Ukrainian crisis. However, according to Breedlove, he has had conversations with General Valery Gerasimov, chief of the general staff of Russia's armed forces, in 2014, even with the relations strained. "We are going to re-establish that, we have talked among several of us senior military leaders how we will do that ... but yes, we are going to re-establish communication with Valery [Gerasimov]," he said. In April, Moscow recalled its chief military representative to NATO for consultations after the North Atlantic Alliance suspended military and civilian cooperation with Russia over the Ukraine crisis. At that time, the bloc also said it would step up its cooperation with Kiev, promoting defense reforms and increasing the activity of a liaison office in Ukraine. Russia's new military doctrine, an updated version of which was adopted in December, was also among the discussions at the NATO's defense ministers meeting in Brussels on Thursday. NATO's position on certain issues might be revised according to the doctrine, Chairman of NATO Military Committee Knud Bartels said. The core of Russia's position is unchanged, with the Russian military remaining a defensive tool, which the country pledges to use only as a last resort. But there have been additions to the threats against the country's national security, with NATO military buildup and the American Prompt Global Strike concept listed among them. 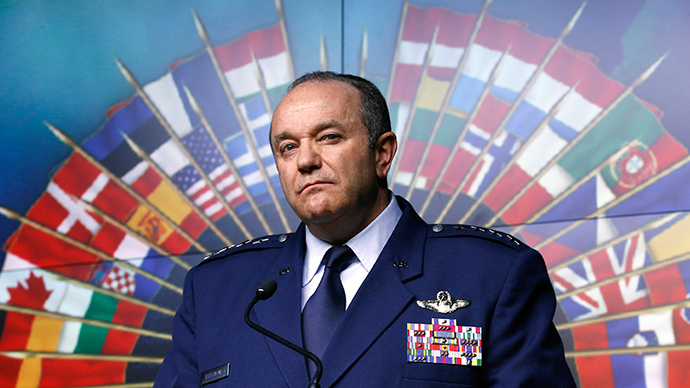 At the meeting on Thursday, General Breedlove said NATO doesn’t pose any threat to Russia.